The Plaza: This is the pie of your dreams. We use both mozzarella and ricotta cheeses, complemented by our perfectly seasoned Italian sausage and roasted red peppers. 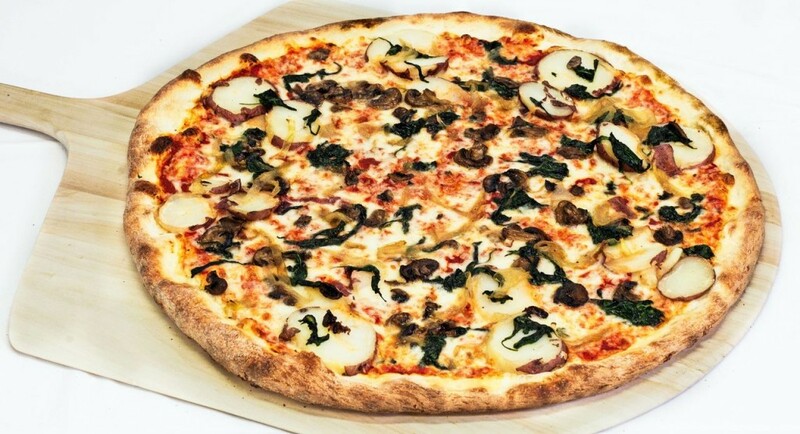 The Goodman: We take our delectable caramelized onions, roasted mushrooms, and spinach, and combine them with the hearty flavor of red potatoes to make a pizza you’ll be thinking about for days. The Newport: In Vegas for a trip? Wait until you tell your friends back home that you had a pizza delivered with delicious dollops of ricotta cheese, roasted artichoke, peppers, spinach, onions, and eggplant.